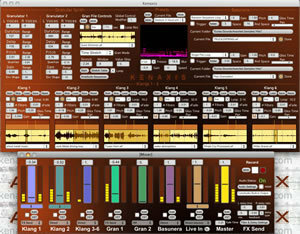 Kenaxis v3, Other Music Software from Kenaxis Creative. 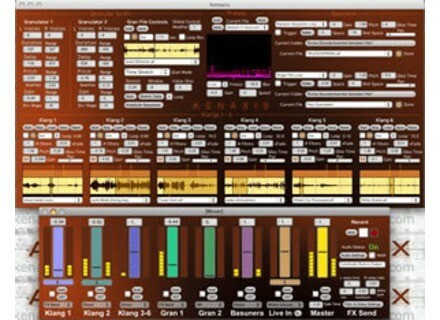 The Mac version of Kenaxis, a real-time audio performance application, has been updated to version 3.3 (the Windows version will be available very soon). Added Multitrack Record: This is useful if you want to remix material you create while using Kenaxis. You can now create separate stereo files for each of the Kenaxis objects such as the Klangs, Granulators and Freeze when recording. SoftStep Support: If you own a Keith McMillen SoftStep, Kenaxis is now optimized to use it. It's set up to use the LEDs and display on the SoftStep so that not only is the SoftStep an input device but it shows the status of Kenaxis as well. Sync Klangs 2-5 to Klang 1: You can now automatically sync live loop recordings done in Klangs 2-6 to the length of your loop in Klang 1. New manual that covers all of the additions to Kenaxis (Check it out for more information on the new additions). Value Randomizer Prefs added to customize how a random impulse works (Command E). The price has been dropped to $49 (it was over $130). AuraPlug AmpFire 2.3 AuraPlug has updated the Windows version of AmpFire to version 2.3.